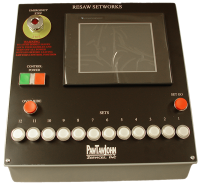 Resaw Systems - Paw Taw John Services, Inc.
Servo Sensor® motion controllers mounted in linebar hydraulic cylinders. Board sizes, operational limits, Servo dynamic values, servo limits, etc. are entered through the touch screen display and saved in the PLC battery backup ram.